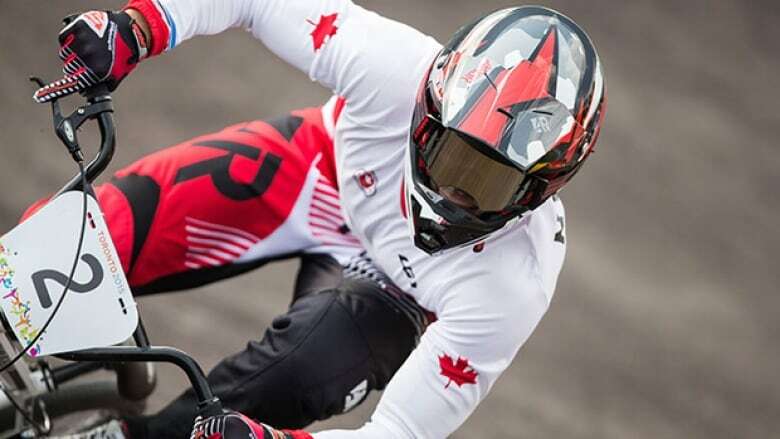 With six screws still lodged in his left foot from a bad spill at the end of the last BMX racing season, Canada's Tory Nyhaug raced to the gold medal in the men's final at the Pan Am Games on Saturday. Tory Nyhaug put the screws to his competitors. The six screws that are still lodged in his left foot from a bad spill at the end of the last BMX racing season, to be precise. The 23-year-old Coquitlam, B.C., native blew away the competition Saturday in the final of the men's BMX competition to win Canada's second gold medal at the 2015 Pan American Games. "It's unbelievable," said a jubilant Nyhaug after receiving his gold to the thundering applause of the partisan home crowd at Centennial Park in Etobicoke, Ont. "That's as perfect a day as you can have in BMX racing. I knew the final would be a battle and I knew all week I could do it." Nyhaug missed the first three months of this racing season following surgery on his left foot. He was on crutches for three months and said that while he was unable to train, he did plenty of work on the mental side of being an elite athlete that he believes has really paid off. He started riding again at the beginning of April. "There are certain times in your career with injuries and bad races that things can change in an instant in our sport," Nyhaug said. "On days like this it makes those early morning training sessions in the rain and the injuries all worth it. This is the feeling I wake up for every day." Nyhaug's coach Ken Cools said Nyhaug's confidence played a key role in winning the gold medal. "Nobody doubts himself less than Tory Nyhaug," Cools said. "That gate drops and the whole world melts away. That kid is the most amazing BMX racer I've ever come across. He's physical, he's powerful, he's aggressive and if you give him and inch he'll turn it into a foot. He does not hold back at all. He has one mode — attack." That said, Cools insisted Nyhaug had to be smart to claim the final race. "The key was being aggressive, but being smart at the same time," Cools said. "He couldn't be too aggressive in the turns and he had to keep a good line. He's got the capability of doing it so it was just a matter of getting to the finish line on his bike." After winning the final, Nyhaug soaked up the glory, parading a Canadian flag around the finish line in front of the crowd that stood to cheer on their national hero. He loved every second of it." "This is the highlight of my career, no doubt about it." Nyhaug declared. "To finally come through and win a race like this in front of the home crowd is an experience I'll never forget." Nyhaug said he did his best to stay relaxed prior to the final and he knew he had a slight advantage over the field because he was in Lane 1. He earned that opportunity by winning all three preliminary races as well as the semifinal. "As soon as I got into the first turn I just relaxed and rode a clean lap," Nyhaug said. "I was having clean laps all day. As soon as I came over the last roller I knew I had it and, wow, what a feeling." The men's final came on the heels of a women's final that feature a spectacular crash which wiped defending Pan Am and Olympic champion Pajon Londono out of the race. Nyhaug insisted that did not get into his head. "No, not at all," Nyhaug said. "To be pretty honest, we are kind of numb to that stuff. We've crashed a lot on our own and we see crashes every race. It's something we have to deal with." Now he has to deal with being a Pan Am gold medallist too.